GLITTER also provides a variety of plotting and diagnostic options allowing the user to evaluate the quality and significance of each analysis during the run. The laser-ablation ICPMS microprobe (LAM-ICPMS) was introduced more than ten years ago, largely through the work of geologists (especially the group at Memorial University, Newfoundland), and is now becoming an important technology. The capability for rapid, sensitive, spatially-resolved in-situ trace-element analysis will have the same impact on the geosciences (and material sciences) as the spread of the electron microprobe (EMP) did in the 1970s. Today the EMP is found in nearly every significant geoscience laboratory in the world (academic, government, industry, commercial laboratories). An equivalent market potential exists for a well-designed, effective LAM-ICPMS. The development of on-line, real-time data reduction was a major factor in the rapid spread of EMP laboratories in the 1970s. It enabled the user to view the results of an analysis within seconds of data acquisition, and to use that in put to guide further analytical strategy. Compared with the off-line data reduction available previously, this meant a great increase in productivity, flexibility and applicability. This interactive analytical environment is now taken for granted in EMP work. A similar interactive environment has not been available for the LAM-ICPMS. To meet this need, GEMOC has now developed GLITTER, the GEMOC Laser ICPMS Total Trace Element Reduction software package. This new interactive program gives users of the laser ablation microprobe a unique analytical environment. 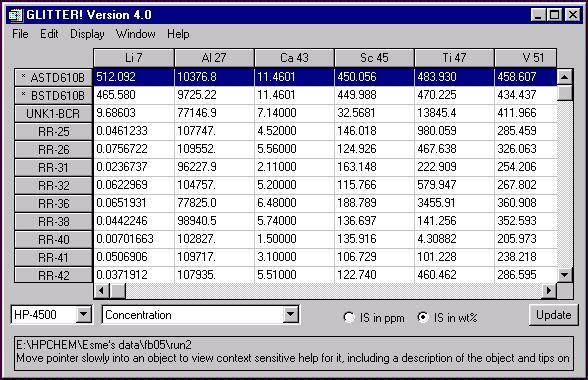 It provides real-time on-line data reduction for the LAM-ICPMS, and features linked graphics and analysis tables, greatly improving both productivity and the flexibility of analysis. A variety of plotting options allows the user to evaluate the quality and significance of each analysis during the run, and to dynamically change the focus of the session if required. GLITTER is written in the IDL programming language and provides cross-platform support for a number of environments, including Windows, MacOS, and Unix. The current release supports the Perkin Elmer ELAN 5100, 6000, 6100 and HP4500, Agilent 7500, Micromass, ThermoFinnigan Element, ThermoFinnigan Element II and VG-PQ2, utilising the time-resolved data output option. It can be readily adapted to other LA-ICPMS systems which can produce time-resolved signals. If your ICP-MS instrument is not listed here, don't despair, please contact us for information about adapting GLITTER to your systems. GEMOC has developed an analytical protocol for the in situ dating of zircons by laser ablation ICP-MS using the U-Pb isotopic system (see "Analytical Methods". 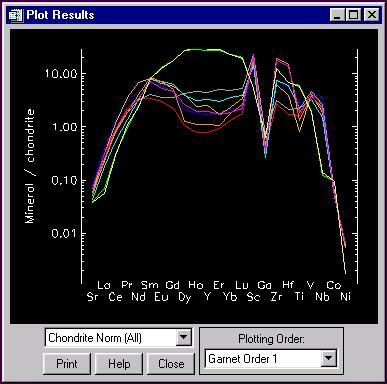 GLITTER allows the rapid reduction of these data, calculating age estimates from isotopic ratios and plotting a concordia diagram (see example below). Data are displayed as single isotopes or as isotope ratios in the "Review" window, and isotope ratios, age estimates and one sigma uncertainty estimates (ratios and ages) can be displayed in the table and exported to an ASCII text file. Further details and applications are included in (Jackson, S.E., 2001.;Knudsen, T.-L. et al., 2000. and Belousova, E.A. et al., 2001). Ma population. Each data point is plotted on the concordia diagram within seconds of data acquisition, and discordant points can therefore be identified quickly and easily. The Review window is shown below. It illustrates defining signal markers based on a plot of 207Pb/206Pb isotope ratios. The GLITTER "Main Window", containing the main menu options and the table of results. The "Standards" window, calling for the user to input the identity and values of the internal standard. The "Review" window, where the time-resolved laser signals are viewed and integration intervals are selected by the user. The "Plot" window(s), where data are visualised in various ways. 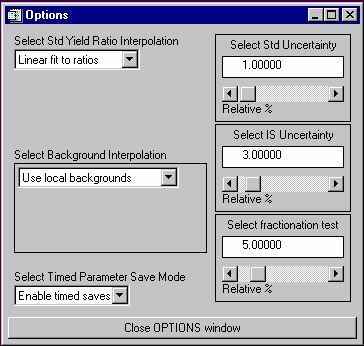 The "Options" window, where the user can control the yield interpolation options, background fitting, magnitude of uncertainty estimates etc. If marker positions are changed in the "Review" window, the table of results and all dataplots on the screen at the time are automatically updated to reflect these changes. The selected (highlighted) analysis number in "GLITTER" is also the selected analysis number in "Review" and "Plot", and vice versa. Data can be written to disk as ASCII text at any time, for further off-line analysis in spreadsheet programs. The main GLITTER window is the front-end of the program from which all other operations are carried out. It also contains a table which can display various results, including trace element concentrations, one sigma uncertainty, detection limits, raw counts data etc. In "Isotope-ratio" mode, GLITTER displays the isotope ratios of interest (for example 207Pb/206Pb) as well as the age estimates (in Ma) calculated from the various ratios for each analysis. When the dataset is first loaded the "Standards" window appears automatically and prompts the user to identify the internal standard and enter the values in the table provided. Internal standards can be changed at any time during the session. Up to three isotopes can be used as internal standards, and are chosen from droplists. Compositions of reference materials (such as the NIST 612 glass in the example below) are held in GLITTER's data library. GLITTER selects a default set of integration intervals for the background, and signal, counts; these can be changed interactively by the user at any time in the "Review" window. Analysis labels are displayed on the left and the time-resolved laser ablation signals on the right. 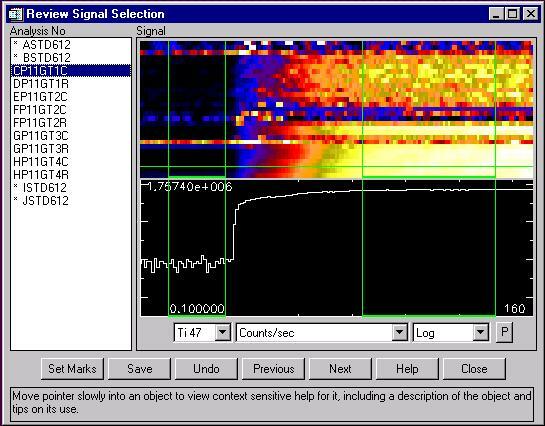 The top pixelmap display shows all isotopes for the selected analysis (each row of pixels = one isotope), with colour representing signal intensity (blue represents low signal, yellow represents high signal). The bottom display shows the signal for a particular isotope (in this case47Ti) selected using the horizontal green marker in the pixelmap display. Integration intervals are selected by dragging the four vertical markers. The framed area at the bottom of the window contains context-sensitive on-line help. On-line analysis means that the results for each analysis are calculated during the run as data are acquired. The first results are calculated as soon as one standard and one sample have been analysed. With each additional standard analysis, the data are instantaneously adjusted to take account of changes in the analytical conditions such as instrumental drift and no off-line reprocessing is required.